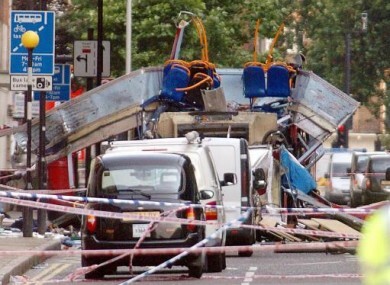 The scene of the Tavistock Square bus explosion in the 7/7 London bombings in 2005. BRITISH POLICE have contacted two Irish people who may have been victims of the News of the World’s alleged phone hacking. Sean Cassidy, father 7/7 London bombings victim Ciaran Cassidy, told the Independent that the was shocked to be informed by police that his phone may have been hacked after his son’s death. Fifty-two people were killed in suicide attacks carried out by four people on underground trains and one bus in London six years ago today. Police investigating the phone hacking allegations are checking if the 7/7 victims’ families’ phones have been hacked. Meanwhile, a lawyer involved in the inquest into the death of Lady Diana has been alerted by police that his phone messages may have been hacked. A charity which supports members of the British forces has dropped the newspaper as its campaign partner after allegations emerged that it may have hacked the phones of the families of members the British armed forces killed in Afghanistan and Iraq, the Guardian reports. The Royal British Legion said it couldn’t “with any conscience” continue to campaign alongside the newspaper pending a resolution of these allegations against it. News International, which owns the newspaper, said it was contacting the Ministry of Defence over the claims and said in a statement that it would be “absolutely appalled and horrified” if the allegations were found to be true. Some of the newspaper’s advertisers including Ford, Boots, Vauxhall and Halifax have pulled their advertising from the NOTW in response to the allegations. Email “Warnings of potential Irish victims of NOTW phone hacking”. Feedback on “Warnings of potential Irish victims of NOTW phone hacking”.